Black and white negative showing the Arseneau Fuels hockey team. They played in the Sunday Afternoon Mercantile League and were champions of the league in 1967. Back row: Bob O'Brien, Mike Gray, Terry Davis, George Young. Centre row: Larry Heffering, Bill Griffin, Sam Stuart, Ernie Stoneman, Mike Heffering, Al McDonald, Jim Tremblay. Front row: Larry Moore, Ron Slack, Ken Litten, Elmer Tran, Gary Kennedy, Dennis Arseneau (sponsor), Tim Gray, Ron Moore. 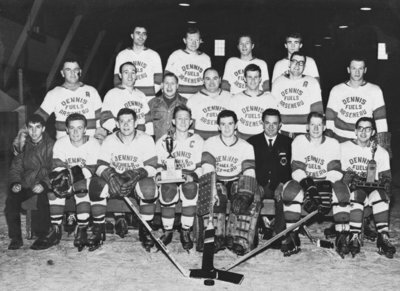 Arseneau Fuels Hockey Team, 1967, Bill Stannett, Whitby Archives, 21-005-032.